GEORGE ROCHBERG (1918-2005): Carnival Music, PETER SCULTHORPE (1929-2014): Mountains, DAVID MASLANKA (1943-2017): Piano Song, BARNEY CHILDS (1926-2000): Heaven o clear when day did close, GRAEME KOEHNE (b.1956): Twilight Rain, WENDY HISCOCKS (b.1963): Toccata. Description: This recording was made by Australian EMI in 1985, then somehow fell through the cracks and was never issued. It has now been resurrected from an 'approval' copy tape sent to McCabe, the original master having disappeared, in excellently restored sound. A very interesting recital in its own right - most of the pieces, all very approachable, are first recordings or very rarely heard - and a fine example of McCabe placing his exquisite pianism at the disposal of contemporary music in which he believed. The most substantial work here is Rochberg's five movement suite of pieces that blend tough modern piano writing with popular forms, written in 1970 as the composer was getting fed up with modernism and was turning toward the rediscovery of a very personal neo-romantic style that later occupied him. The Blues and Ragtime movements are the genuine article, worthy of Bolcom, but they are dovetailed with strident fanfares, a bleak, spare Largo doloroso, and shadowy apparitions from the world of Romanticism. Sculthorpe's Mountains, inspired by the landscape of Tasmania, is imposing and majestic, despite its brevity; Hiscocks' Toccata is a high-energy, motoric specimen of the familiar genre, and the Maslanka is a subtle and evocative response to a tranquil New England summer, in simple melodies and rich, shimmering chords. Banks delivers exactly what his title promises; the Koehne is Impressionistic, clearly indebted to Debussy; and the Childs is an harmonically varied fantasia, illuminating the line from a Ben Jonson poem that provides its title; the composer describes it thus: "About two-thirds through, after a jazz-directed section, the music moves into an ever-quieting series of chords, and its concluding melodic line works for me in evoking the luminous stillness summed up by the Jonson poem." 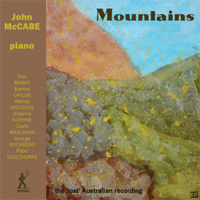 John McCabe (piano).